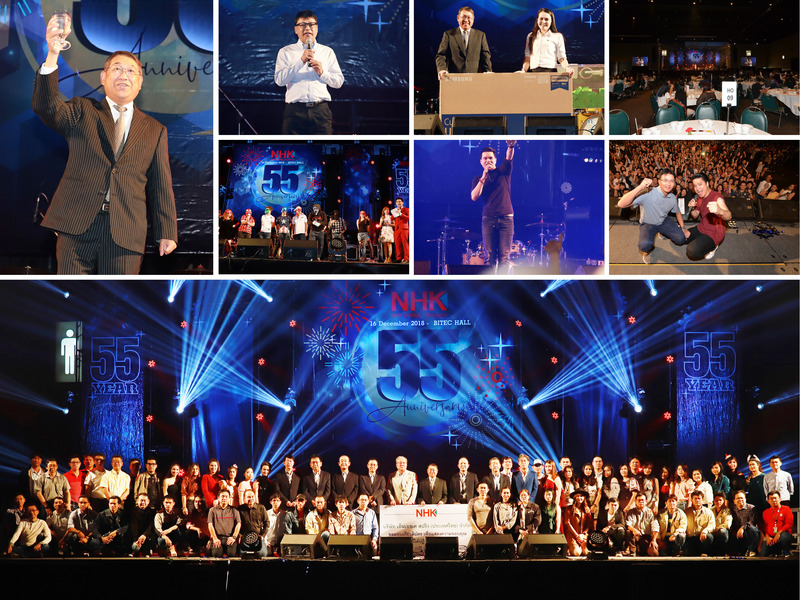 On Sunday 16th December 2018, NHK SPRING (THAILAND) CO., LTD. celebrated the 55th anniversary at the BITEC Exhibition and Convention Center, Bang Na. The president of NHK SPRING (THAILAND) CO., LTD., Mr. Ryuichi Shibata honored for the opening ceremony and the chairman of the Automotive and Metal Parts Workers Union of Thailand, Mr. Yongyuth Menapao greeted staff in the event. During the event, staffs who worked over 10-40 years and senior executives took photographs together for souvenir and gratitude. In addition, there were lucky draws for staffs and musical performances from the Montien band. In this 55th anniversary celebration was honored by Mr. San Sansilp, DDS factory staff and the song owner “Ra-Berd-Wae-la” with over 200 million views as a guest singer. Mr. San Sanailp was impressed that everyone sang and enjoyed with the show. At the end of the event, it is time to meet a famous singer “Ae Jirakorn” who was a quality artist and known as “Black Crow Mask”. For over an hour and a half, Ae Jirakorn brought happiness and hit song such as “Jai-Glang-Kwam-Ru-Suek-Dee-Dee” and others to everyone. Throughout the event made over 3,000 staff smile, pleasure and impression with this event. Let’s meet again with the 56th anniversary celebration of company foundation.